Hi! 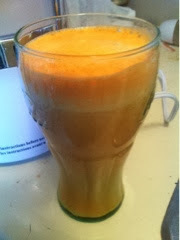 Welcome to day 12 of my juicing reboot! I'm so very proud of myself for making it this far. So for this little millstone I've got a new juice I want to share. It's become a favorite. Mainly because it taste like an Orange creamcicle. Yumm.